Leamington Spa is a spa town in central Warwickshire. The town is noted for its parks and gardens, particularly the The Jephson Gardens, close to the Royal Pump Rooms. Leamington Spa - Travel by coach - If you'd like to speak to someone about your journey you can ring Traveline on 0871 200 22 33. Leamington Spa - Travel by road - Leamington Spa is about 4 miles north of Junction 15 of the M 40 Motorway. The M 40 Motorway links London to the West Midlands. Leamington Spa is about 20 miles from Solihull, Birmingham and 100 miles from London. Leamington Spa - Travel by train - Leamington Spa Station, Old Warwick Road, Leamington Spa, CV31 3NS. CCTV. Ticket office. Waiting room. Refreshment facilities. Pay phone. Shops. Toilets. Whole station step free access. Wheelchairs available. Taxi rank. Birmingham International Airport Ltd, Birmingham, B26 3QJ. Tel: +44 (0)8707 335511. The airport has an extensive range of facilities to offer passengers, visitors and staff whilst at the airport. The airport rail station is only a two minute ride away, and just one mile from Junction 6 of the M42. The airport is adjacent to the National Exhibition Centre. Birmingham airport is about 15 miles from Leamington Spa. Coventry Airport Customer Services, Phoenix House, Coventry Airport South, Siskin Parkway West, Coventry CV3 4PB. The passenger terminal is located just off the A45 at Toll Bar End Roundabout. Coventry Railway Station is 3 miles from Coventry Airport. 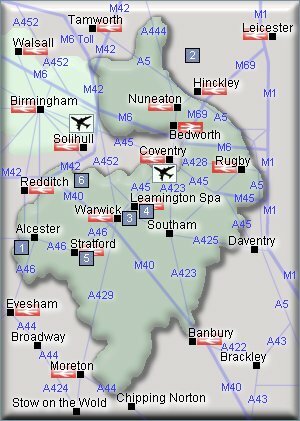 Coventry airport is about 6 miles from Leamington Spa. Leamington Spa - Sport - Ten Pin Bowling. Leamington Spa Tenpin, Shires Retail Park, Tachbrook Park Drive, Leamington Spa, CV34 6RH. Tel: 0871 550 1010. Leamington & County Golf Club, Golf Lane, Whitnash, Leamington Spa, Warwicks, CV31 2QA.Tel: 01926 425961. Leamington Spa - Shopping - Marks & Spencer, 70 The Parade, Leamington Spa, Warwickshire, CV32 4BT. Tel: 01926 451837. Woolworths - 60-62 The Parade, Leamington Spa, CV32 4DB. Tel: 01926 423127. Leamington Spa - Entertainment and attractions - Royal Pump Rooms, The Parade, Royal Leamington Spa, Warwickshire, CV32 4AA. Tel: 01926 742 700. Leamington Spa - Other information - Wellesbourne Watermill, Kineton Road, Wellesbourne, Warwickshire, CV35 9HG. Tel: 01789 470470. Warwick Castle, Warwick, Warwickshire, CV34 4QU. Tel: 0870 442 2000. For hotels in other areas nearby see Coventry hotels & Stratford upon Avon hotels. For bed and breakfast B&B accommodation in other areas nearby see bed and breakfast in Kenilworth & bed and breakfast in Warwick. For self catering accommodation see self catering accommodation in Banbury & self catering accommodation in Rugby. Rugby is 85 miles from London. It is 46 miles from Redditch to Rugby and 53 miles from Hinckley to Chipping Norton. Leamington Spa is about 4 miles north of Junction 15 of the M 40 Motorway. Rail Stations (Not all stations shown). There is a station in Leamington Spa. - Ragley Hall, Alcester, Warwickshire B49 5NJ. Tel: 01789 762090. ragleyhall.com. - Bosworth Battlefield Visitor Centre and Country Park, Sutton Cheney, Nr Nuneaton, Warwickshire, CV13 OAD. Tel: 01455 290 429. - Warwick Castle, Warwick, Warwickshire, CV34 4QU. Tel: 0870 442 2371. warwick-castle.co.uk. - Royal Pump Rooms, The Parade, Royal Leamington Spa, Warwickshire, CV32 4AA. Tel: 01926 742 700. royal-pump-rooms.co.uk. - Shakespearience, Waterside Theatre, 8-13 Waterside, Stratford-upon-Avon, Warwickshire, CV37 6BA. Tel: 01789 290 111. shakespearience.co.uk. - Baddesley Clinton, Rising Lane, Baddesley Clinton Village, Knowle, Solihull, Warwickshire B93 0DQ. Tel: 01564 783294. nationaltrust.org.uk.